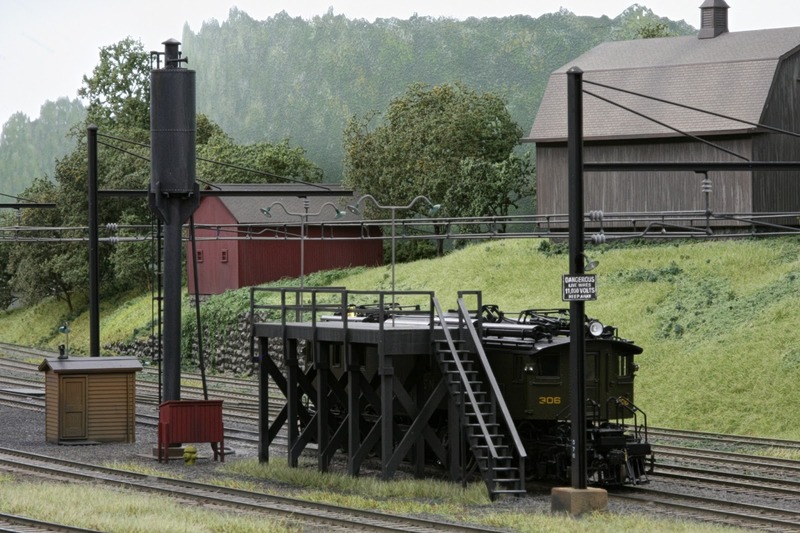 An elevated service platform was necessary for inspection and maintenance of the pantographs and other equipment located on the roof of the motors that were serviced at Danbury. Service was only performed when both pantographs were down and hooked, de-energizing the motor from the 11000 volt catenary. One very important maintenance function was to check the contact horn of each pantograph that rode against the contact or trolley wire. A worn horn or one with holes in it could catch on the contact wire and tear off the pantograph or tear down the catenary or both. Eight screws held the horn to the pantograph allowing non serviceable ones to be easily changed out. Once again finding photographs for reference to build a model of this service platform that was removed in the 1960's proved difficult. The Peter C. McLachlan photo opening part 1 has a good view of the end and staircase but provides little information about the construction configuration or number of the support legs, but is a color photo which is very helpful in that regard. Fortunately there is a photo at the Danbury Rail Museum (www.danbury.org/drm) that has a good 3/4 view of the platform offering enough information about the support legs and between both photos enough to build a creditable model. Below is a photo I took of that photo hanging at the museum. 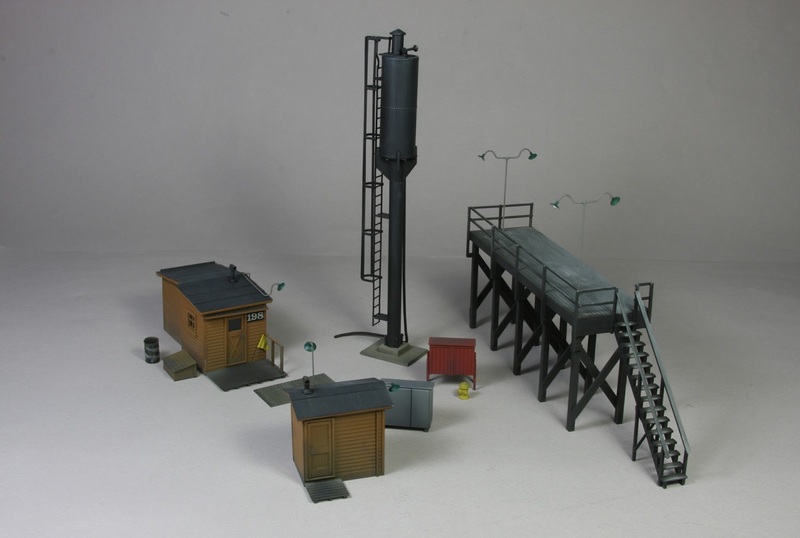 The model is built from styrene strips and sheet stock, a molded styrene staircase from Central Valley was also used. Building a model with ten legs and a staircase is a good example for constructing on a very flat surface, I like to use the glass plate taped to an old drawing board below for this. A cabinet for storing a fire hose is also part of this service group and one of many at Danbury yard. This red cabinet and yellow hydrant can also be seen in the prototype photo above and in the opening color photo in part 1. The simple model below was quick build with styrene. Below is the entire completed service group along with SS 198 before being installed on the layout. Seeing a single motor at the service group indicates that this motor came in on morning train #140, after servicing motor #306 will return to Grand Central Terminal on afternoon train # 143 leaving Danbury at 4:26 pm. Prototype pictures of the hoses used to refuel the motors at the oil pump house and to fill the boiler water tank are still being sought, these details will be added when this information comes to light. Looks great Joe! I don't believe this was there on my first visit around 1962 or 1963. My friend and I skipped school in 5th grade and road the train from Wilton to Danbury to spend the day in the rail yard. We were never questioned. That worked so well the following year we road the train to Pittsfield! Thanks Ken. The catenary was de-energized in February 1961 and the wire came down in 64. Service platform was most likely removed shortly after the wire was cut from power and not there on your "Bueller" day. If you still need a note for your 5th grade teacher, I will write you one.